Ulysse Nardin Lady Dual Time rose gold, Mother Pearl diamond dial. For the woman who travels from coast to coast or travels the world. It is a gorgeous polished 18k rose gold 37mm case, with automatic moment, big date, and mother of pearl diamond dial. Two different time zones and date are displayed at all times. 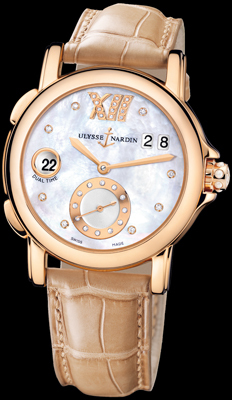 It features an exhibition glass back with a visible 22k rose gold rotor etched with the Ulysse Nardin name and anchor logo. Available on a crocodile leather strap with rose gold regular pin buckle.